René Hugo Arceo & Gabriel Villa. Gallery Night: Friday, April 17, 2009, 5–9 pm. Located on the Lower West Side of Chicago, Pilsen is a vibrant neighborhood of rich ethnic heritage that since the 1970s has been a heart of Mexican Chicago. Its residents have built a set of active cultural institutions that far outpace many more affluent neighborhoods, crowned by the excellent National Museum of Mexican Art and a diverse community of working artists fueling the creative energy of the area. 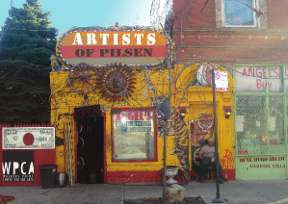 Given historical and demographic parallels between Pilsen and Walker’s Point, we are privileged to be hosting the works by Montserratt Alsina, Mario Castillo, Miguel Cortes, Hector Duarte, Roberto Ferreyra, Ricardo Santos Hernandez, Diana Solis and Roberto Valadez -- artists who shape cultural landscape of Pilsen. René Hugo Arceo & Gabriel Villa both work within the tradition of figurative, socially-conscious art. Born in Cojumatlan, Michoacan, Mexico and trained as a printmaker, Arceo manifests deep engagement with the craft of his primary medium and is strongly influenced by the populist tradition of Mexican printmaking, particularly by the works of Alfredo Zalce, Alberto Beltran and Leopoldo Mendez. In his recent work, Gabriel Villa explores portraiture by focusing on the inhabitants of his home neighborhood. His psychologically-charged, infused with poetic symbols images are imbued with empathy for those marginalized for economic or racial reasons.